This collection of bread recipes will ensure that your kitchen smells divine. Many people place blockers on themselves when it comes to baking bread at home - but believe me, erase all of the horror stories you've heard, take a deep breath - and try to relax. In fact, I find bread making rather therapeutic. Your success with bread making will - at the end of the day - depend pretty much on the quality of the yeast, and whether it is fresh. When purchasing yeast, make sure it is crumbly, smells pleasant and is a pale putty colour. That is, unless you have opted for dried yeast, which comes in satchets. With dried yeast, mix it with the sugar and a little tepid liquid. Allow to stand in a warm place until soft - for approximatley 20 minutes, then cream. After this, just use it as you would the fresh yeast. Keep all of your ingredients and utensils pleasantly warm - but not too hot. Kneading should be done lightly, but firmly. The dough is sufficiently kneaded when you press it firmly with your finger, and the mark comes out. If the impression of your finger stays in the dough, then continue kneading. Do you have a favourite Bread recipe to share? I'm lucky in that I have known so many wonderful people, willing to share their cooking and bakery secrets with me. 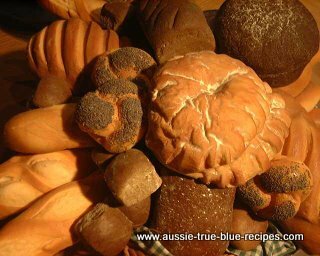 The following recipes are the Basic Bread recipe - pick the one you feel most comfortable with. I have used them all, and haven't been able to say I like one more than the other.
. This page will prove to you that whatever you are passionate about, is worth writing about - because the odds are high that many others "out there" want to know what you know.